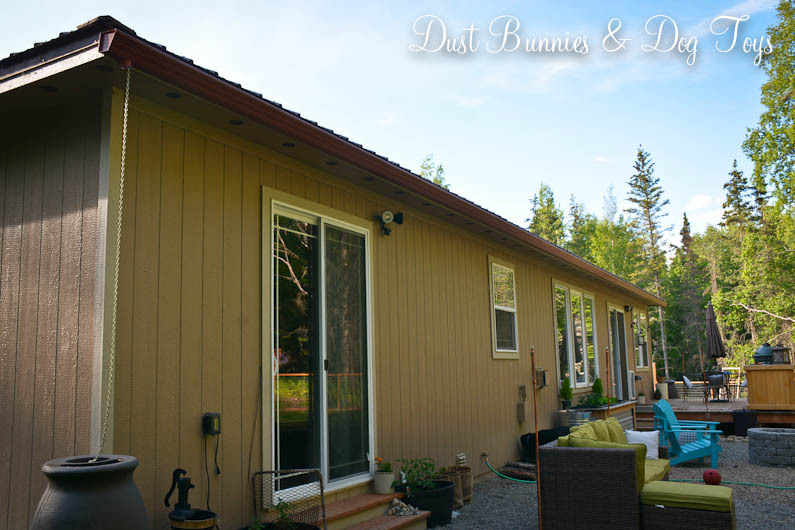 One of the must do projects for this season was installing a gutter on the back of our house. When we installed the garden box last year I thought having the rain water come off the roof into it would be a good thing, but it ended up flooding the box thanks to several back to back storms. As you can imagine that didn’t bode well for my plants. 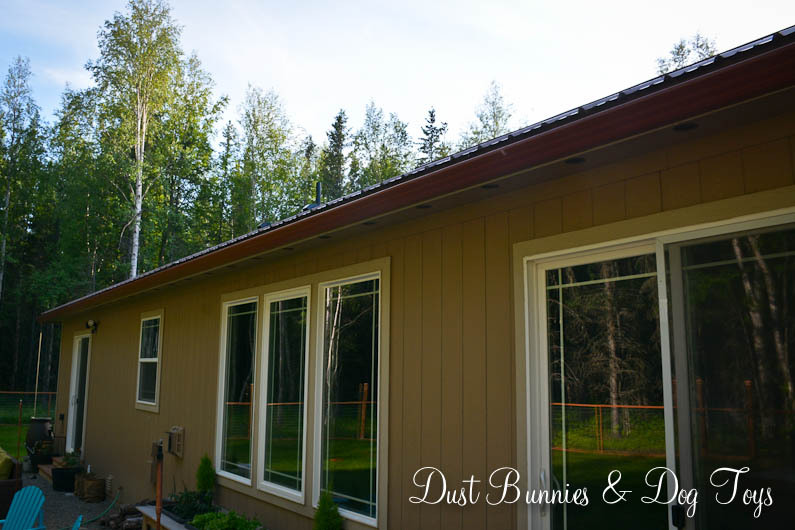 Since the span across the back of the house is a straight shot we considered doing the project ourselves, but then the Hubs discovered Lowes has gutter installation services which qualified for their special financing offers. 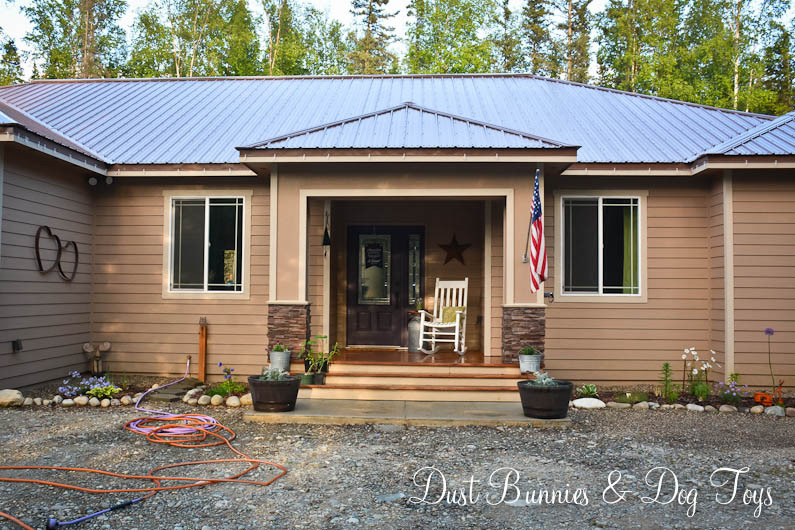 To sweeten the deal the install comes with a 1-year warranty and would only take a few hours opposed to us spending a weekend on the project ourselves. We were sold. 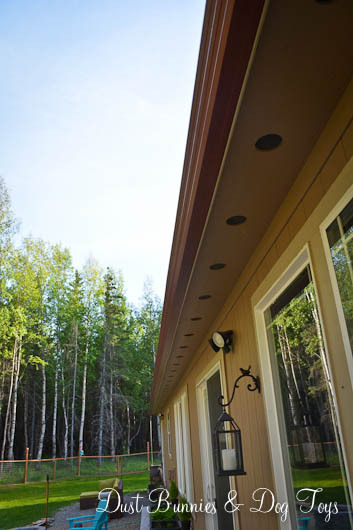 The vendor came out earlier this week and created the 60 some foot seamless gutter right on site and installed it within a few hours. I don’t have any photos of the install since it happened while I was at work, but it was pretty simple according to the Hubs who was on-site to supervise. It’s not a perfect color match for the house or roof, but it coordinates well enough so you don’t really notice it (just like I hope you’ll pretend not to notice my DIY junk puppy defense screens for my tomato plants next to the door there – we’re still in training when it comes to the garden!). 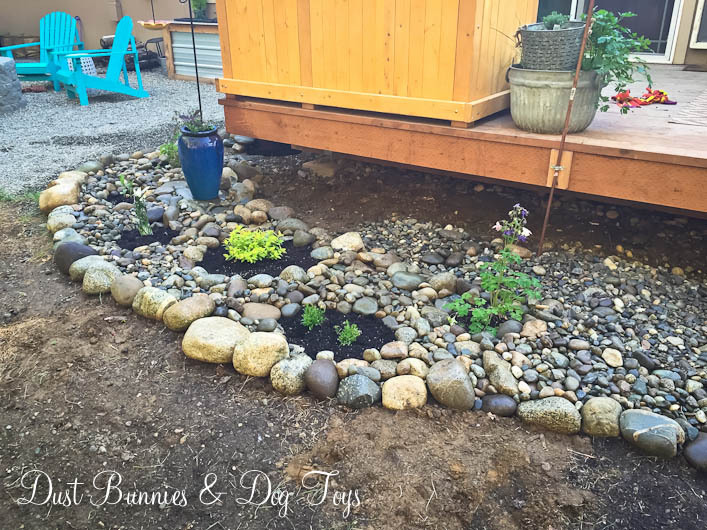 Now the garden box won’t have a permanent divot where the water runs off the roof and I can decide how much to water each plant. 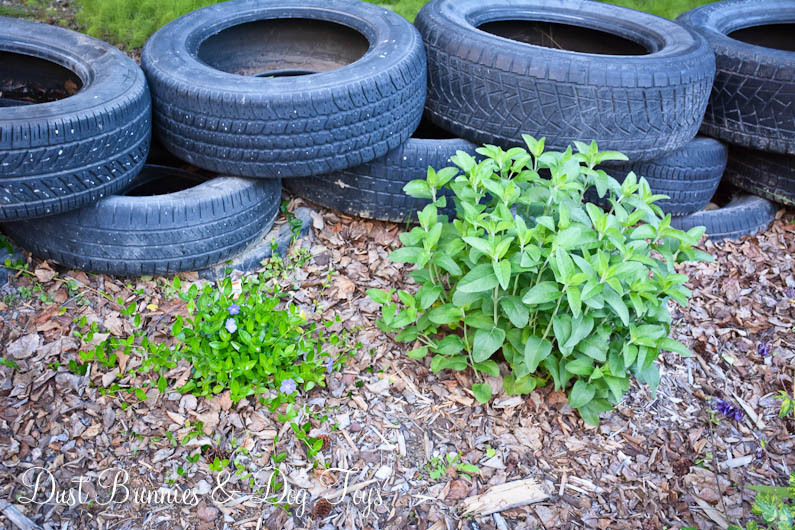 Granted that means watering has become a manual process but luckily, the hose is nearby the box and the rain barrels will be available for watering on each end of the house. 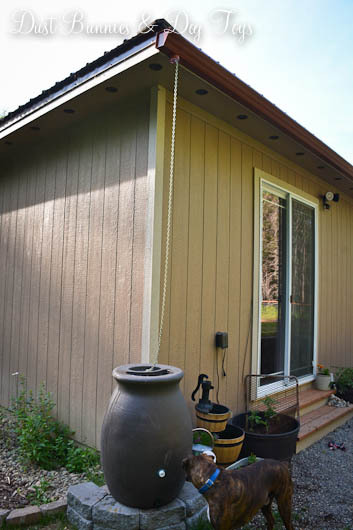 We opted not to have down spouts so we could install rain chains that go to rain barrels at each end. 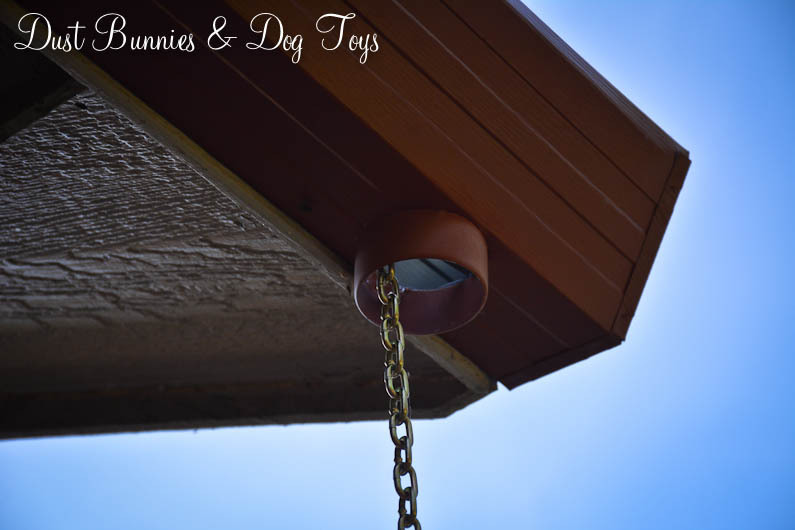 The hubs installed this simple chain from the opening in the gutter down to the rain barrel. We’re thinking it might not be substantial enough to really direct the water if we get a good downpour but we’ll wait and see. If not I’ll pick out a different chain or DIY a decorative one. 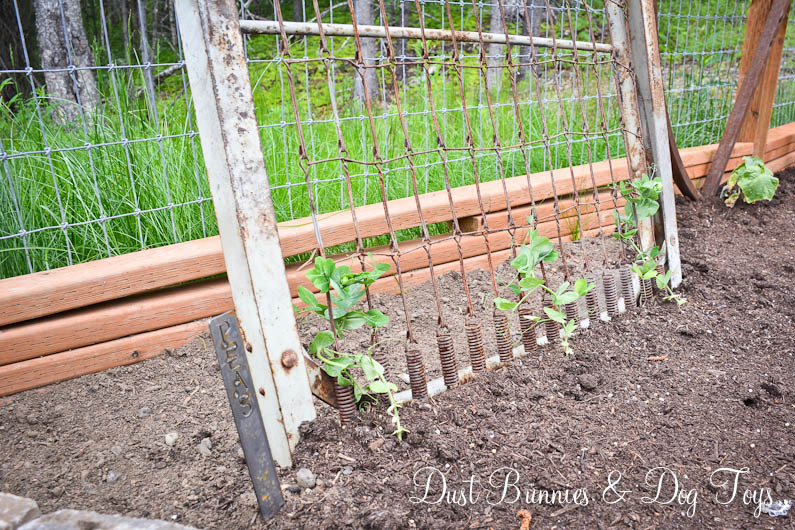 I’ve seen several tutorials on Pinterest using everything from copper tubing to spoons and even driftwood so there’s plenty of options to explore if I need to. 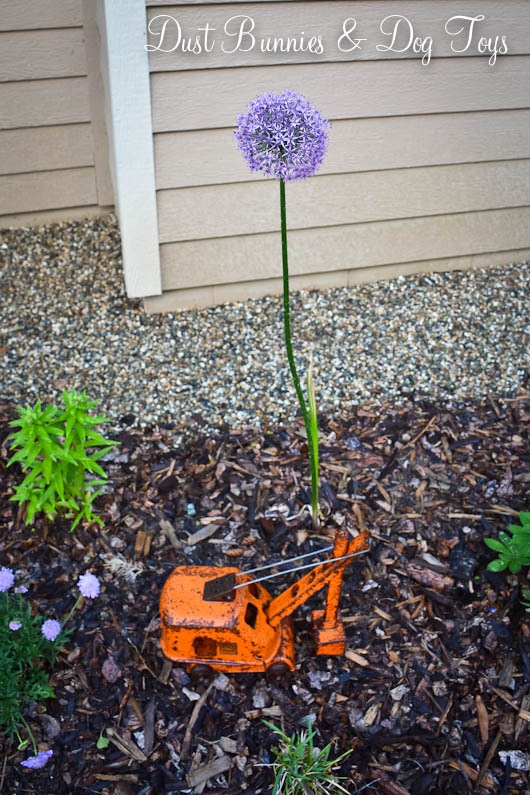 The first thing that showed up was this amazing allium, which sprouted and then produced a long stalk with a odd shaped bud at the top. 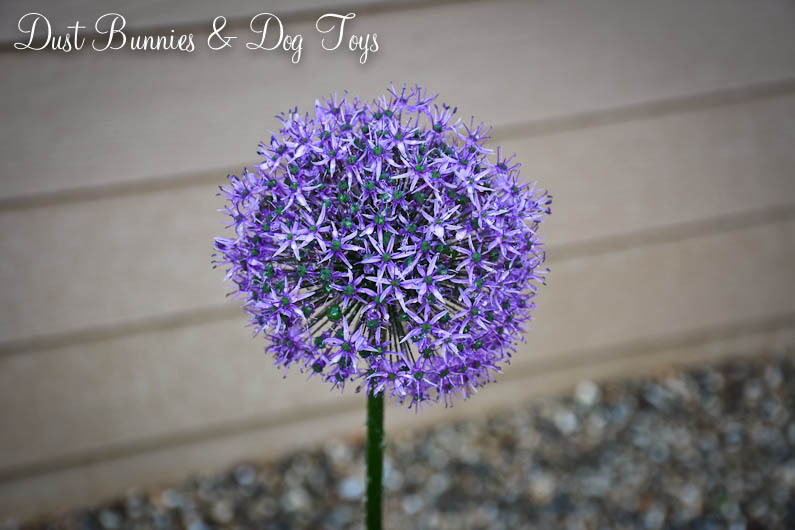 At first I thought an alien had taken up residence in my flower bed, but thanks to the local garden group I was able to identify it and enjoy watching it blossom. We moved the rain barrel out of the small corner next to the garage so it can be used in the backyard with a gutter so the space needed a bit of rearranging. I filled the void from the rain barrel with white iris from my mother-in-law’s garden that I brought back when we picked up Brinley and added some phlox between that and the hosta that has come back much better than it did last year. The phlox is doing quite well and has doubled in size since I planted it, so I’m pretty sure it’s happy there. 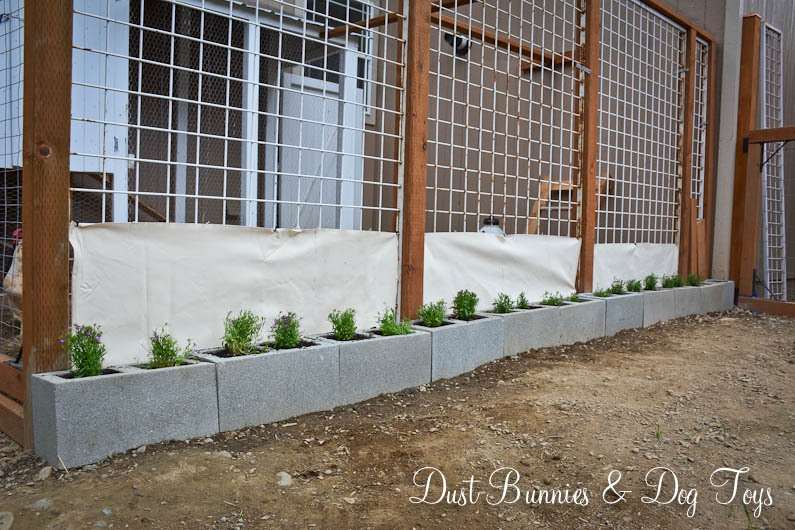 I’m also loving the metal hearts I added on the wall, which will look even better when the plants grow up and fill some of the empty space below them. 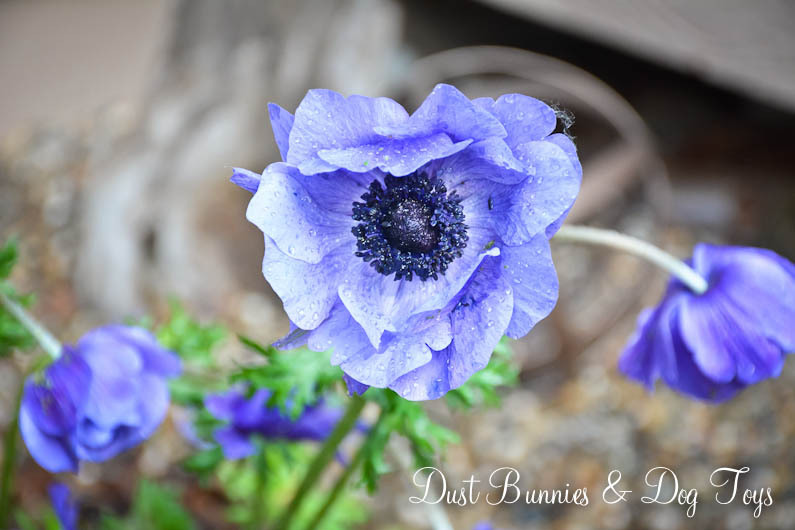 None of the previous plantings on the other side of the walkway came back so I took the opportunity to try something new – an anemone and a sea pink armeria. The armeria reminds me of a Dr. Seuss plant, but hasn’t rebloomed since I deadheaded spent blooms, so I might need to find a better spot for it. The anemone is doing very well, although upon closer inspection last night I noticed aphids so I’ll have to address that. 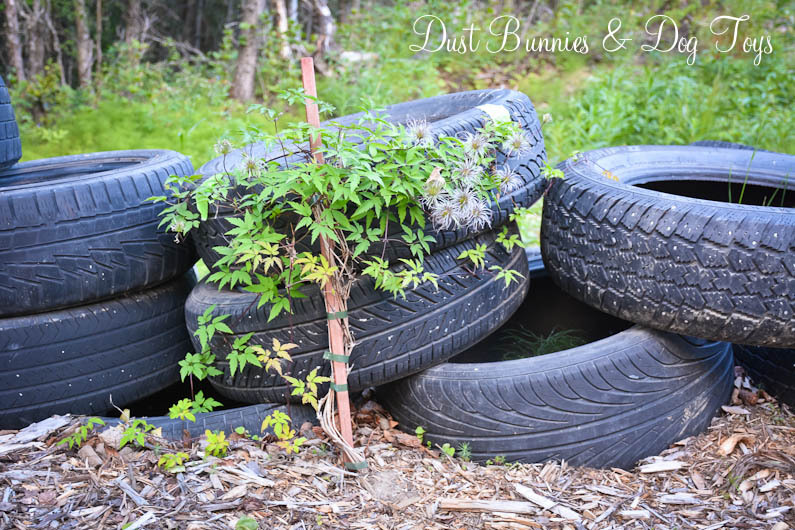 It’s been a horrible season for pests so I’m checking out every DIY remedy available online. 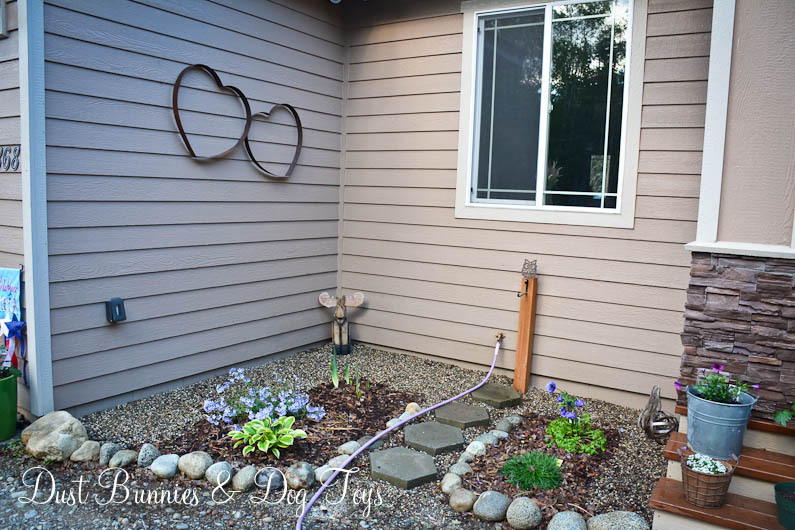 I moved our little wooden moose statute into the corner to hide a cable that comes out of the garage wall until the plants grow in and do that on their own. 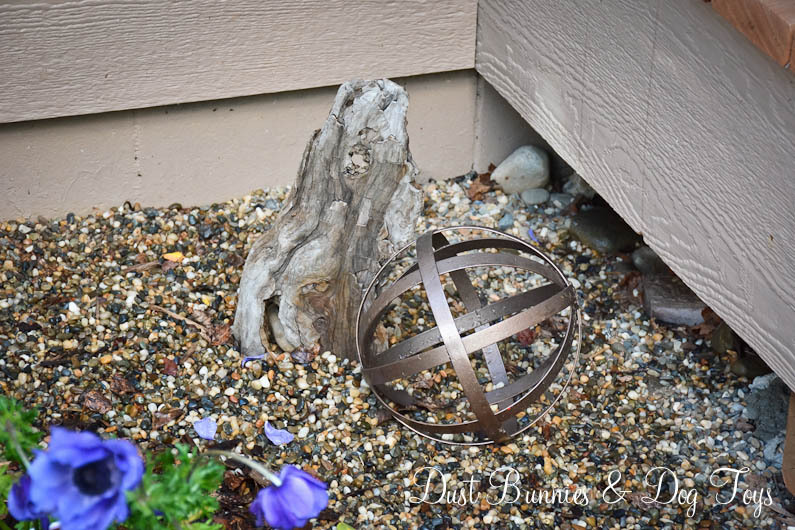 In the opposite corner next to the porch, I paired this metal sphere and piece of driftwood for a fun little garden vignette. There are more spheres on the far end of the bed on the other side of the porch. 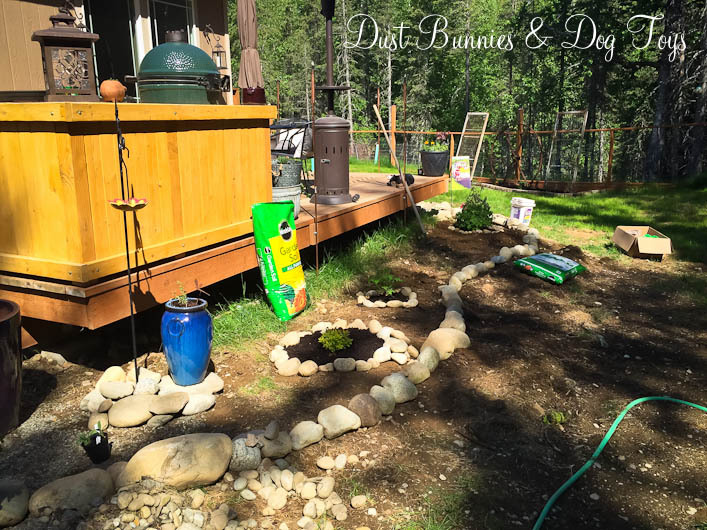 This space got several new plants including daisies, lupine, yarrow and day lilies transplanted from my mother-in-law’s garden. 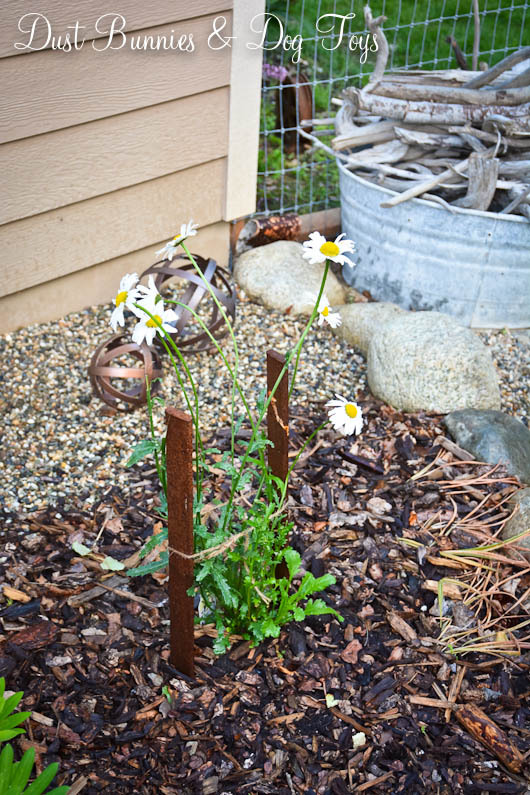 The daisies got a little wild as they started to grow in so I used some of rusty cement stakes to create a little support system for them. I’m hoping they go to seed at the end of the season and self-sow an even bigger crop next year. 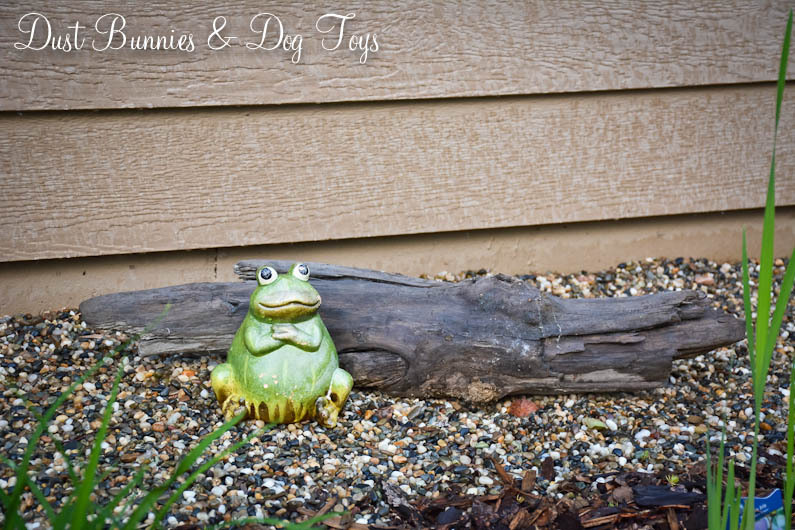 Mr. Frog found a nice little resting spot next to a big piece of driftwood in the back of the bed. He’s sorely in need of a paint job but I think I’ll let him be this season and address that next year since I love his colors in this spot. I filled the whiskey barrels on the stoop with dusty miller and purple alyssum, which has been slowly growing in. 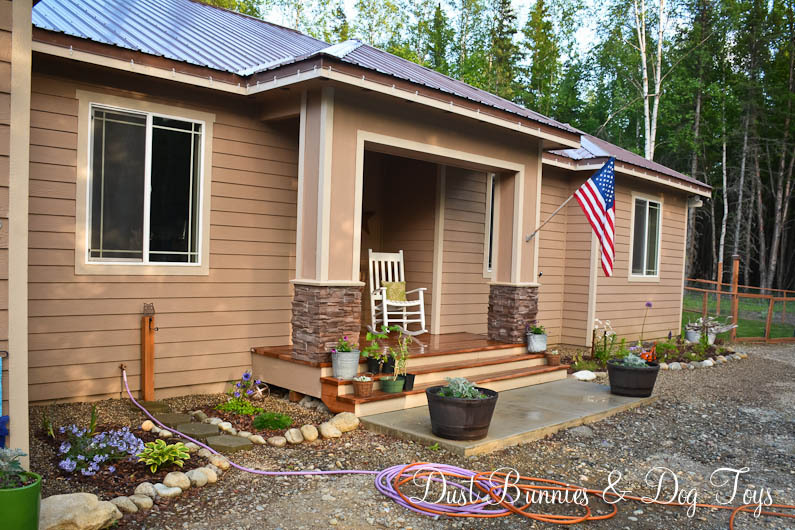 Beyond that there is white alyssum in wire and burlap pots on each side on the first step, with purple daisies in rustic metal pails on the top step. Those extra pots you spot hanging out on the porch are awaiting new homes in the gifted garden along the side of the house. Before that can happen I need to weed that bed and make a bit of room for them. 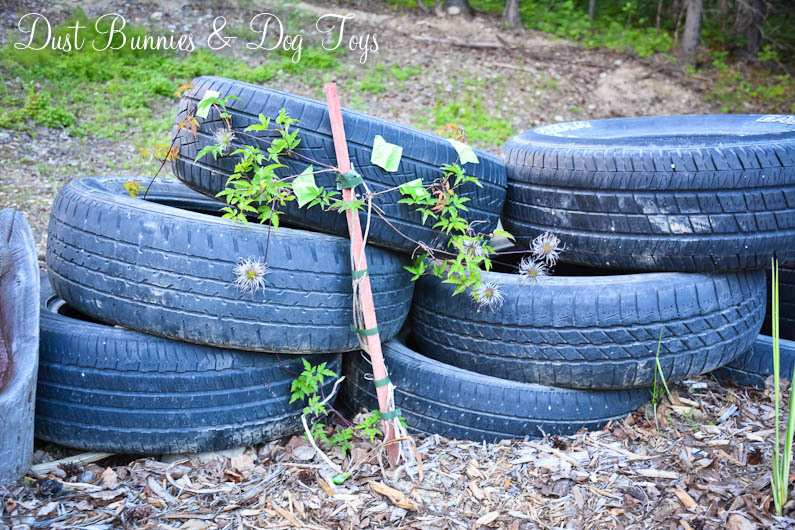 The clematis on either side of the garden weren’t growing in to cover the tire wall as I’d hoped so I decided to give them a bit of guidance with temporary tape. One side is looking fairly lush and seems to have adapted well, but the other side is still a bit sparse. I may add a third and forth clematis along the back wall next year if I don’t see much growth by then. 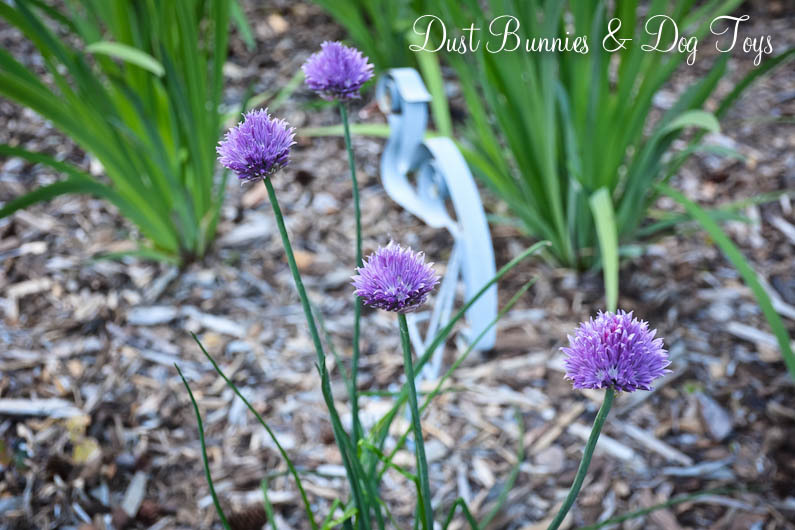 The chives I planted out here at the end of last season when cleaning out the garden box are doing well and have actually bloomed. The mint from our herb planter last year is also coming in quickly. This mystery plant in the front of the garden is growing quite rapidly, but I haven’t been able to confirm what it is just yet. 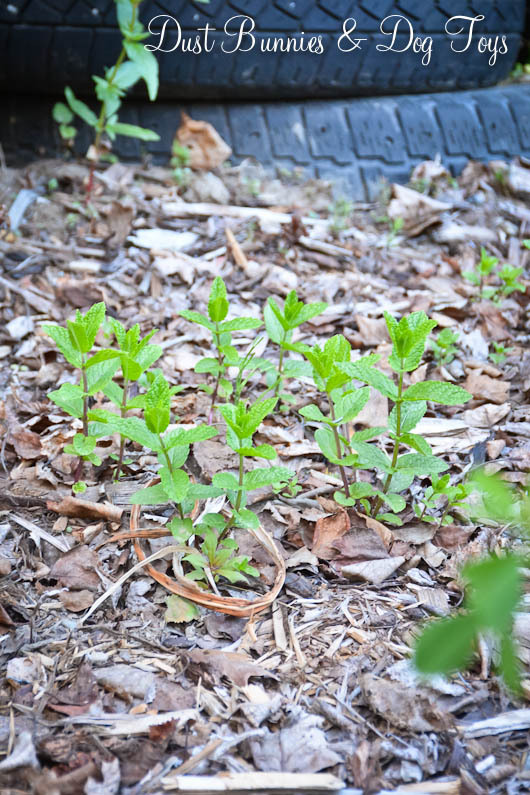 I was surprised to discover the vinca vine I planted when we first did the rain garden had come back in after it showed little signs of life last summer. Next to it the spikewell is quite lush although it hasn’t shown any buds yet. The water iris are slowly growing, but I’m thinking they may not bloom again this year. 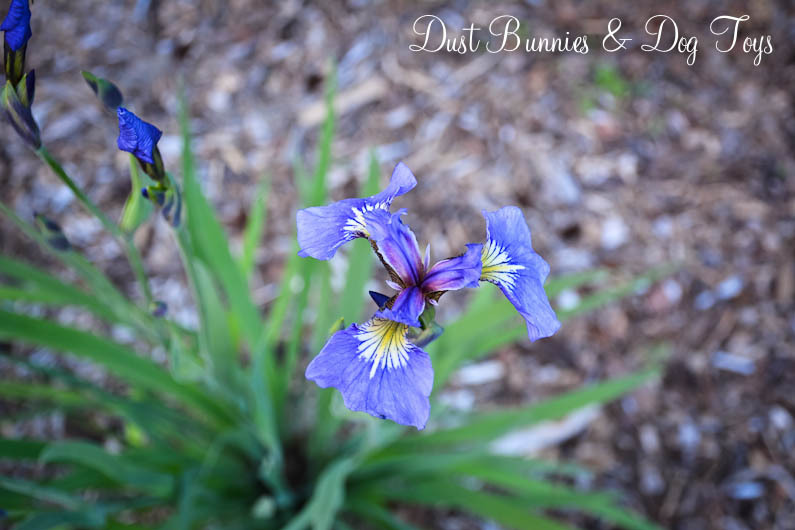 But the large clumps of iris that came from our friend’s yard in Seward have finally started blooming! In fact almost every plant has several blooms opening on it! The other two lilacs that were at the back of the garden have been relocated to either side of the garden so they have room to establish and spread out without crowding each other. I still need to clean up the areas around them but at least they have their own space now. 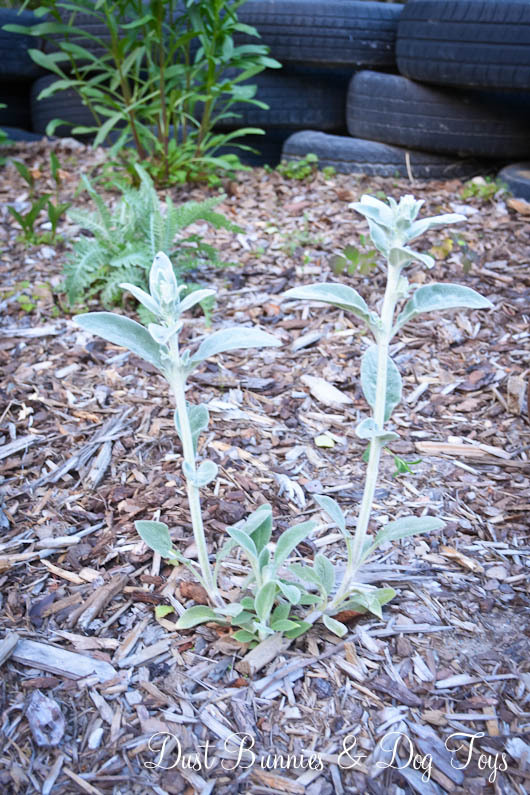 The lambs ear from my mother-in-law’s garden survived the winter after transplant and has grown taller, so I’m hopeful it will continue to grow and create more shoots. Here’s the view from the driveway of the whole scene. The pile of rocks in the foreground are headed for our new rock garden and there are small batches of ground cover along the front that will eventually grow in to cover the slope. Between the house and the rain garden lies the raspberry patch, which is coming along nicely. I pruned back the dead branches to encourage the new branches to produce which worked well since we have lush growth on the stalks and numerous white buds on each plant so we’re on track for a bountiful harvest. 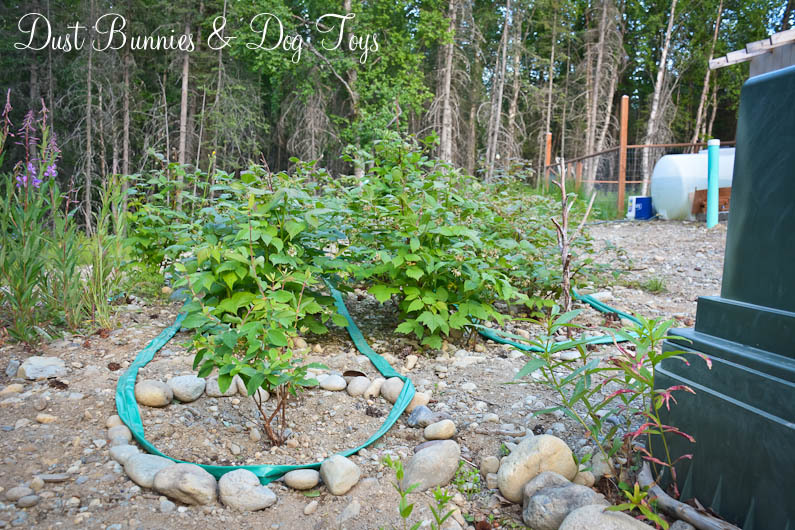 We also added a haskap bush in front of the raspberries. Haskaps are similar to blue berries, but are better suited for our climate. Hopefully we’ll harvest those to accompany the raspberries in our summer time desserts. The hubs also rigged up the big water tank you see in the background to gravity feed the soaker hose in the raspberry patch, which has been super convenient on the occasional hot sunny day. I’ve decided to let the fireweed that’s encroaching on the raspberry patch be for now since both are fairly dominant and should fight each other out. 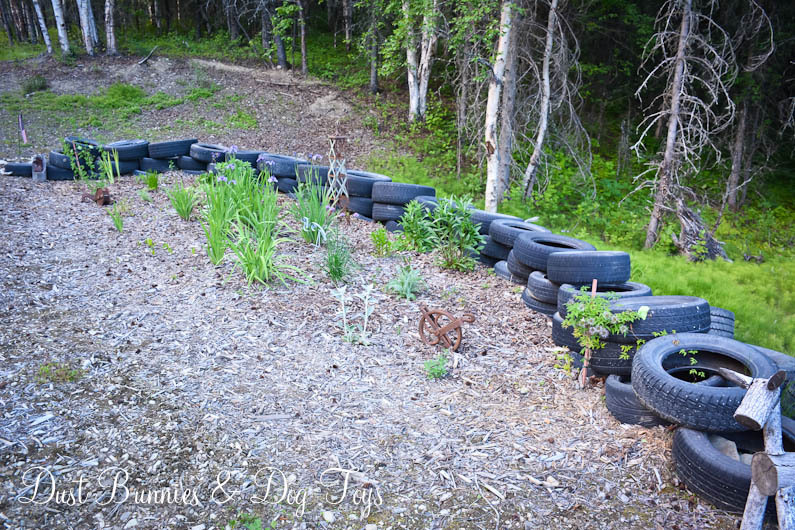 Plus it blocks out the ferns and other undergrowth that would like to spread out from the woods just beyond and if something going to spread I’d rather have fireweed than a thorny Nuka Rose! We’ve been working on one of my big projects for the summer over the past several weeks and although it’s still a ways away from being completely done, it’s finally at a point where I can share the progress. 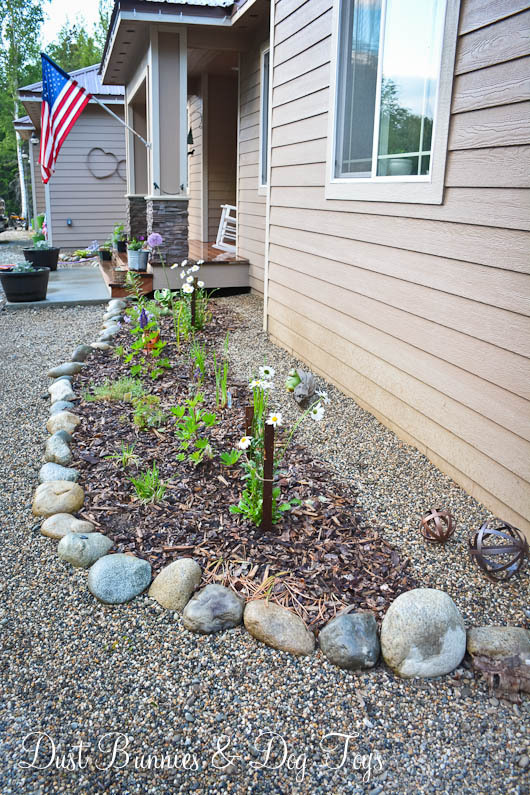 Check out the new landscaping around our back deck! 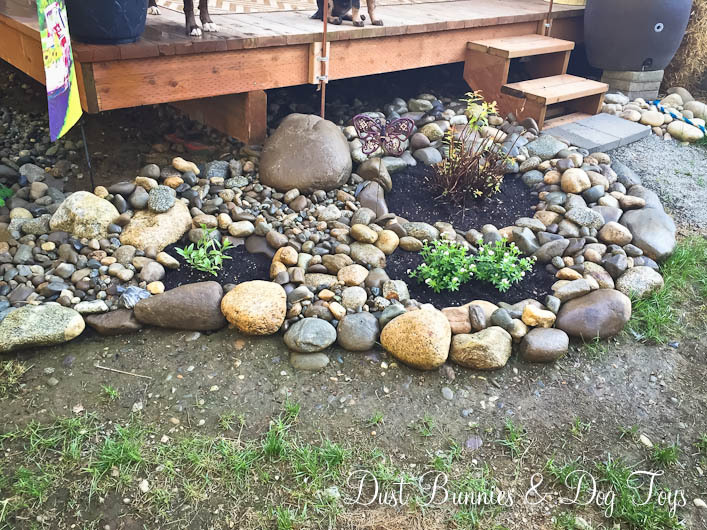 It’s been an intensive project, especially since we’re sourcing all of the rock from else where around our property, but that keeps cost low. 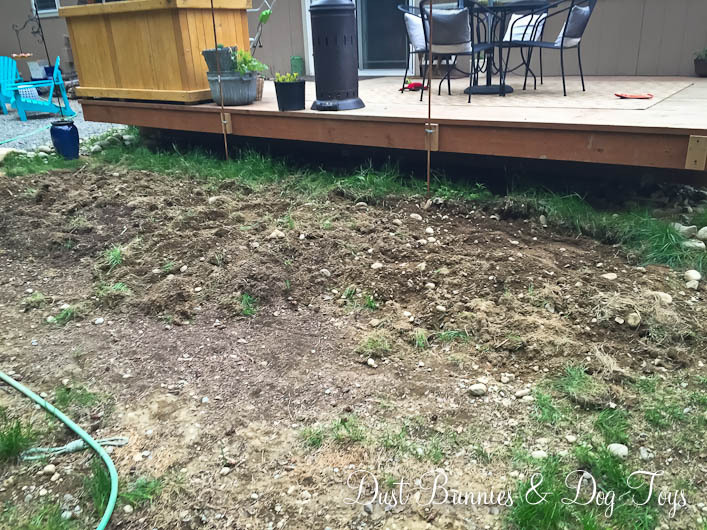 Here’s how the space looked just after the Hubs tilled it right before Memorial Day weekend. Talk about a blank slate! But I had a vision and have evolved the plan as we’ve put it together. The biggest break in this project came when I spotted some boxes on the side of the road with some green sprouts sticking out of them. 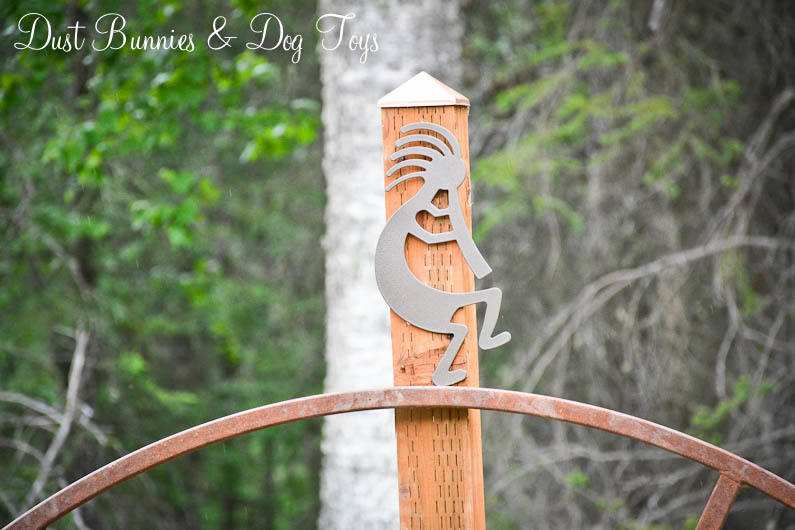 We were on a schedule to get somewhere so I didn’t dare ask the Hubs to stop to investigate and when we came home later that day we used an alternate route so I was sure they had likely been claimed. 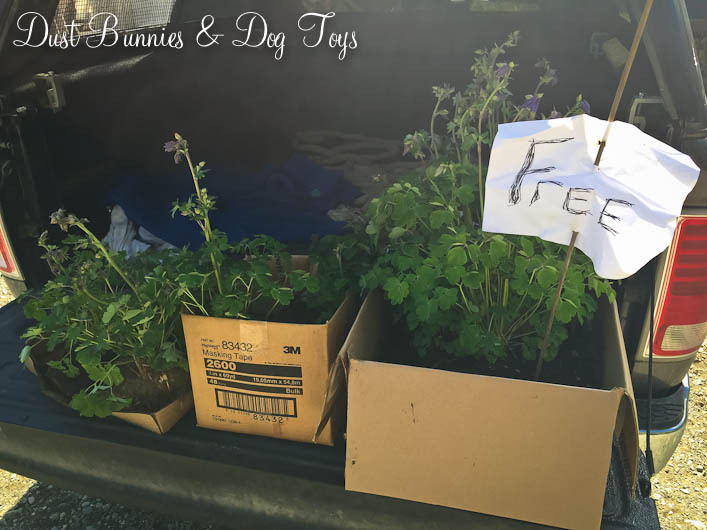 Luckily, the next day we drove by again and they were still there so this time I made the Hubs pull over and quickly stashed this amazing haul in the truck! Big beautiful columbine plants! And there were lots of them too! I could have filled this whole bed with them, but I didn’t want this area to be all about one thing, so a few of the larger ones went in this bed and the rest found homes in the gifted garden and the rain garden. 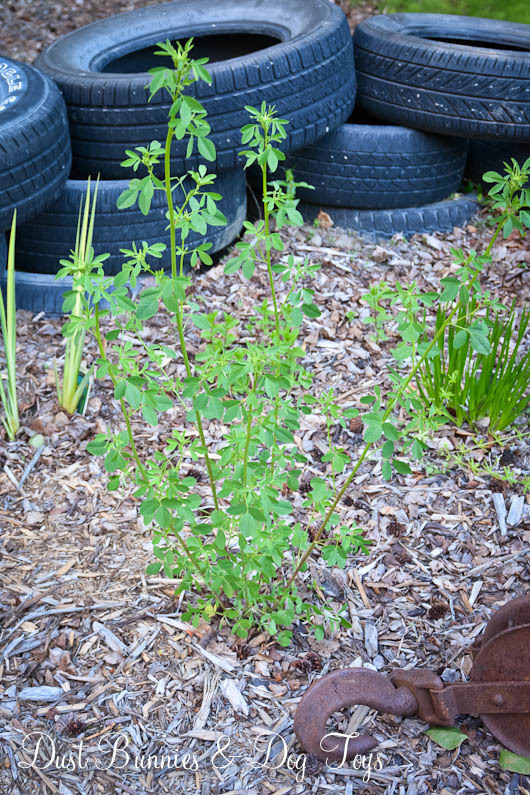 Here’s how things were looking mid-way through after I’d planted the columbines and a few other plants, including a spirea I weathered over in the pot from the end of last season and a couple new plants from a local charity plant sale. And here’s how things are looking these days. 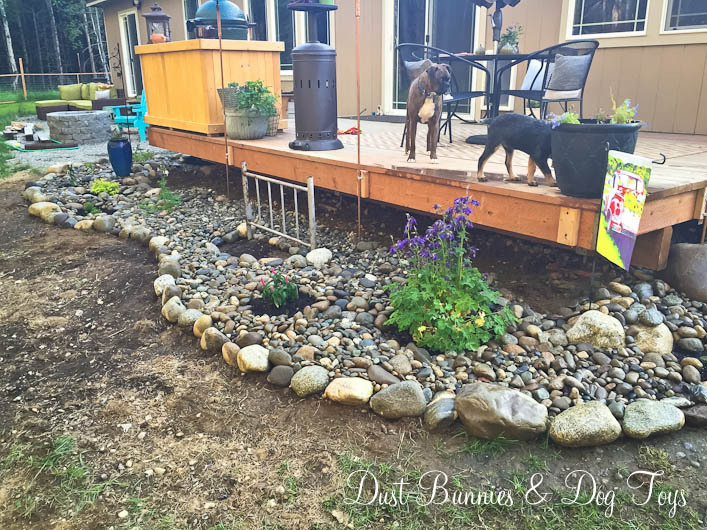 I’ve still got a lot to fill in along the edge of the deck and plan to put more rock a bit under the deck to complete the look, but I’m super happy with how it’s looking so far. Here’s a view of the far side where the Hubs added steps so we no longer have to walk all the way around the deck to go feed the chickens! I’ll be sure to share the finished project when it’s all done, but until then enjoy this before and after! 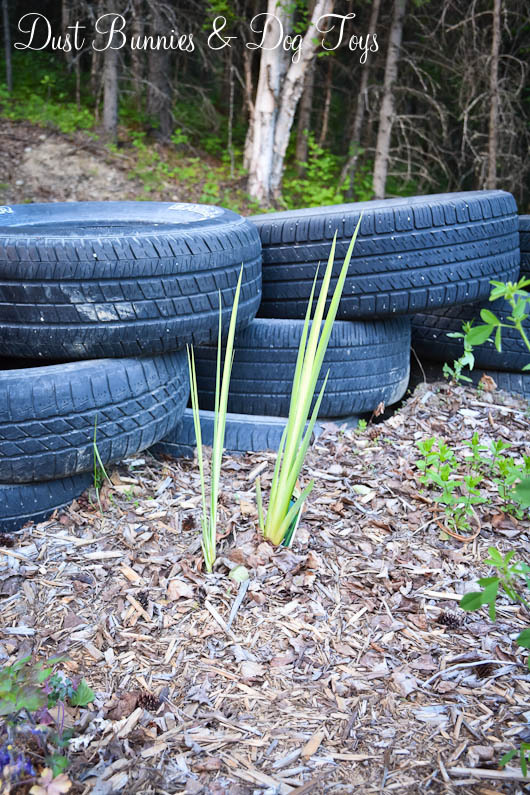 From a mess of weeds to a defined space. What a difference! 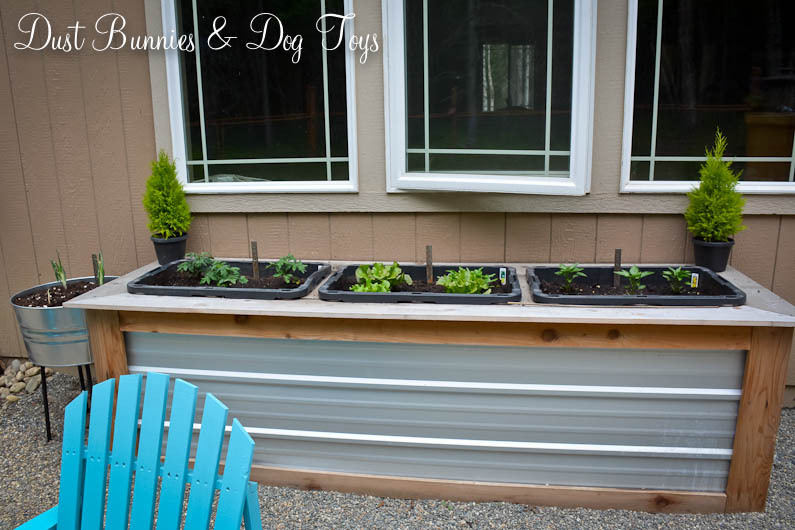 Today I thought I’d share a quick peek of our veggie garden and a quick DIY planter I installed. 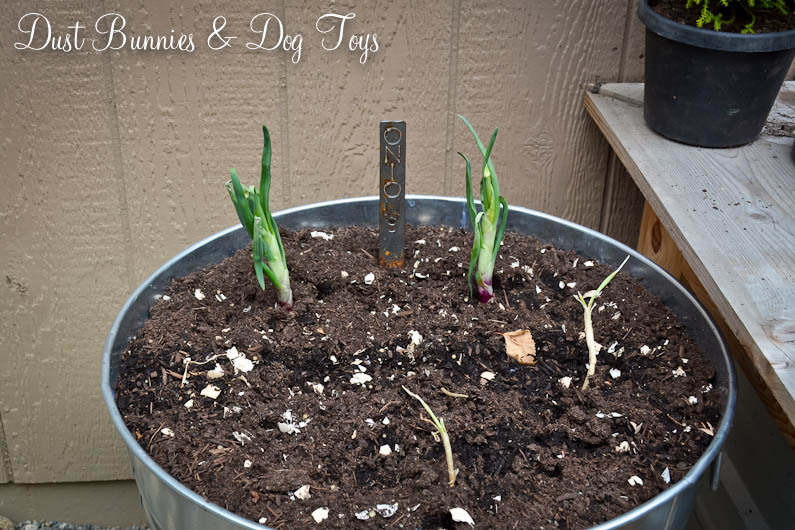 We had a red and white onion sprout in the pantry so I figured I’d give them a shot in the garden this year. 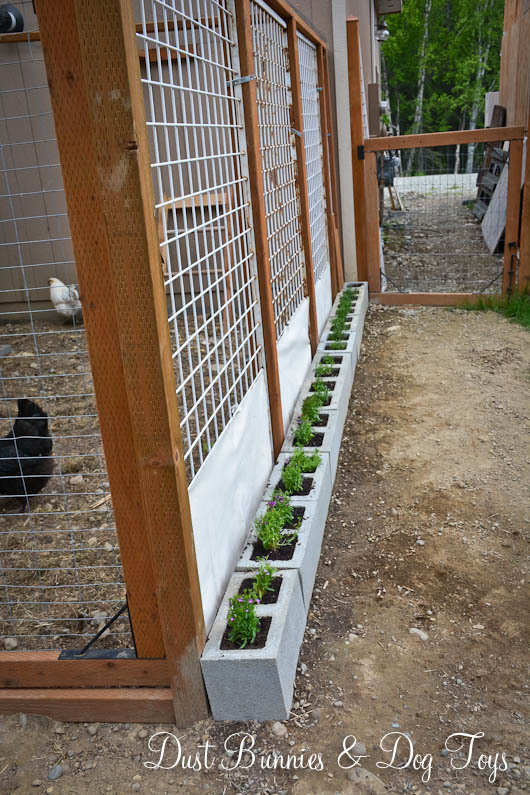 With all the spots in the garden boxes full I decided to add a secondary planter at the end of the box. 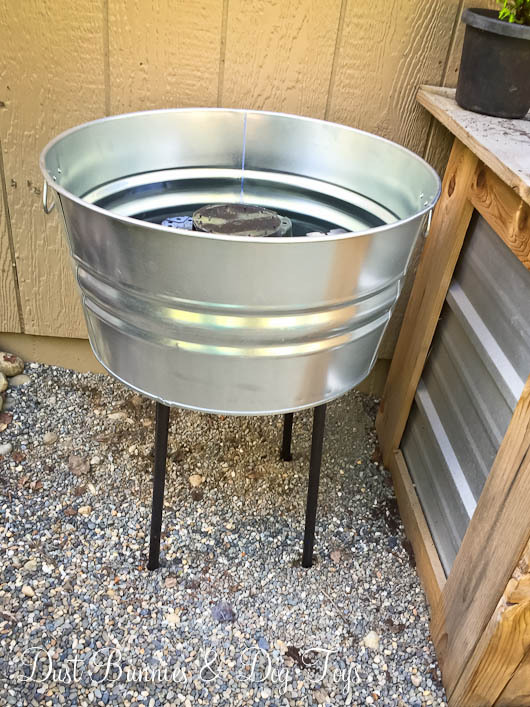 I originally envisioned using an antique wash tub and stand, but just wasn’t willing to pay $100+ for a planter. 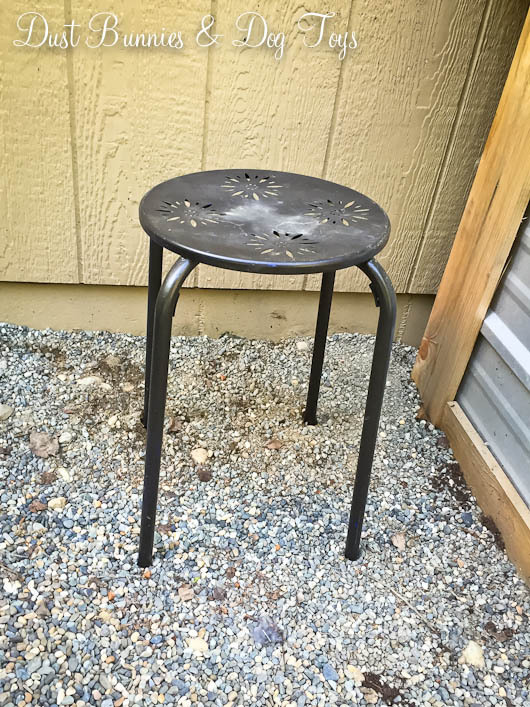 So I used my DIY skills to create something similar starting with this metal stool we’ve had for several years. You originally saw it on our balcony at the rental house. It’s since been painted over and the hubs was using it to position the fan for his big green egg, but now that he has his table he doesn’t use it any more, so it was available to be repurposed. 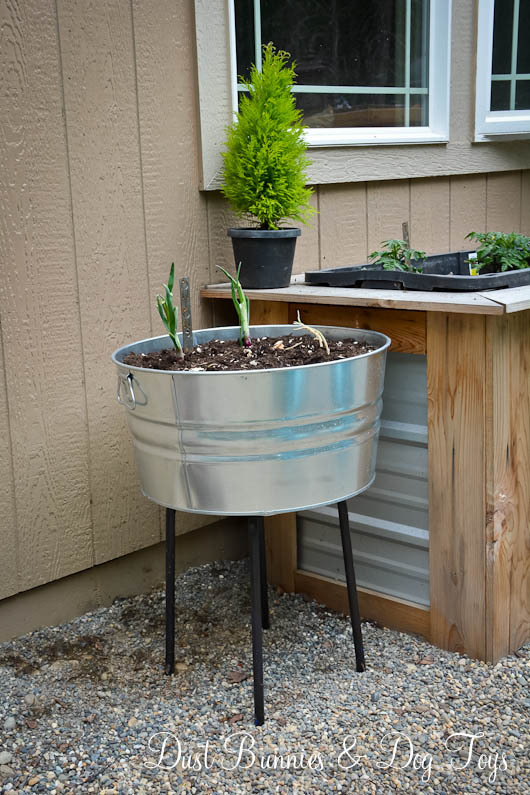 I added this large metal tub on top of the stand to create a planting space. The Hubs drilled a couple of holes in the bottom of the tub for drainage since this sits just under the edge of the roof. 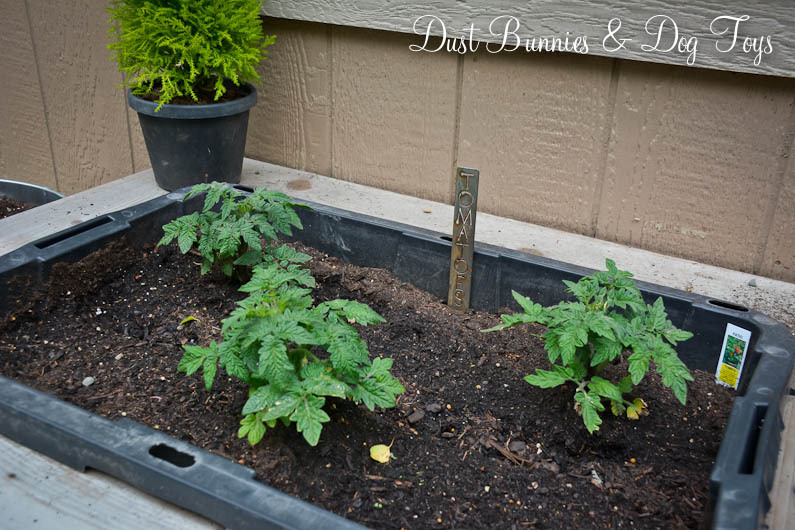 I used empty pots to add additional drainage space and reduce the amount of garden soil needed to fill the tub. Luckily, I had quite a few to choose from! 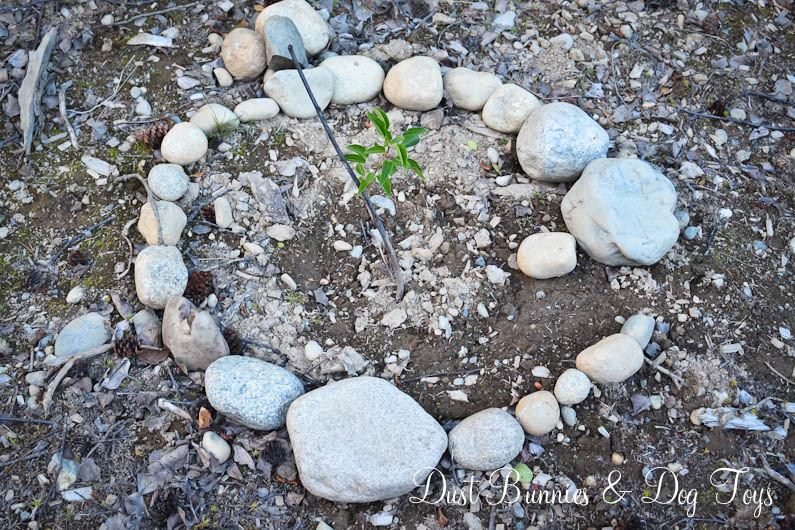 And here it is filled and planted. I’m not sure if this little experiment will yield a harvest but it’s interesting to give it a try. 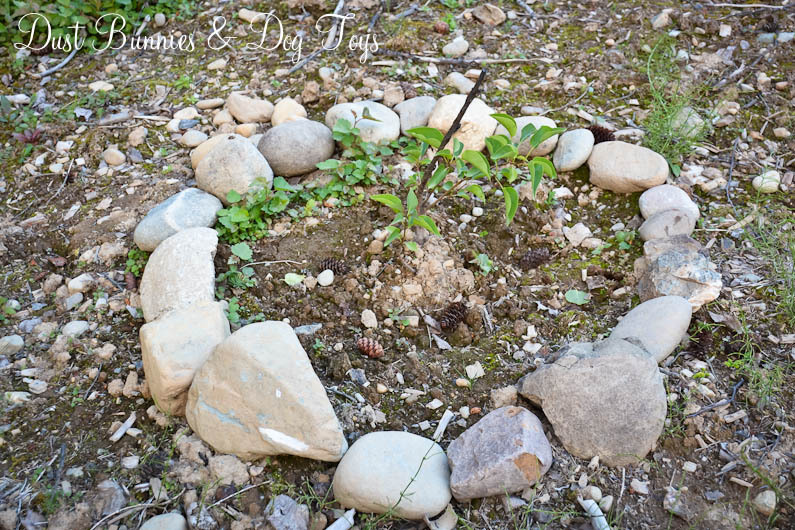 It looks pretty cute next to the main garden box, which I decorated with two lemon cypress trees on either side. I’ve been wanting some of these and finally spotted them at the nursery so I snagged two. They are supposed to be natural mosquito repellants so that’s a nice added bonus, especially since the windows are right there. In the box we’re growing peppers, lettuce and cherry tomatoes. 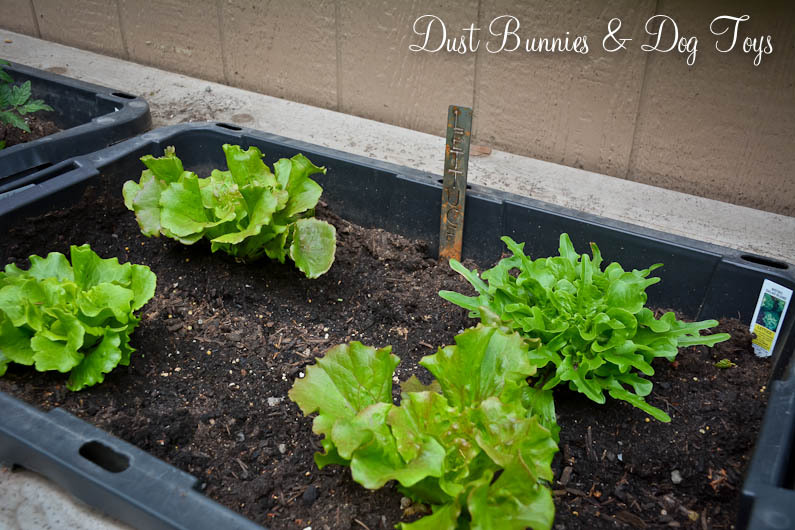 We’ve already harvested some of the lettuce for salads several times and the tomatoes have tiny buds on them. 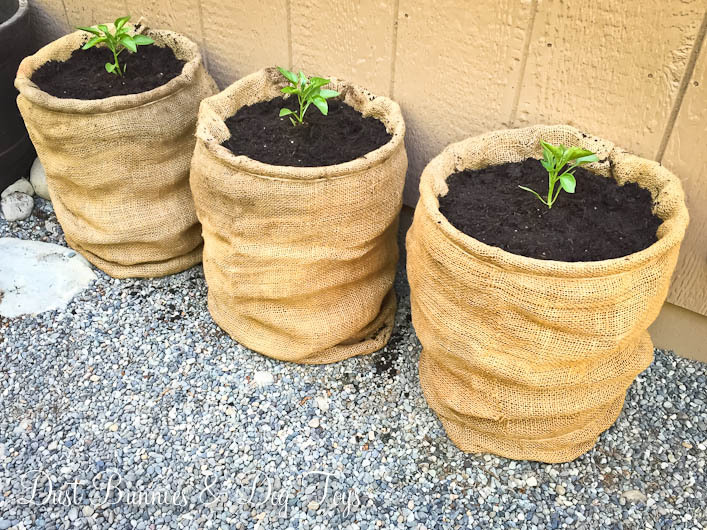 The peppers are the same as the ones in the burlap planters I shared previously, which sit next to the large whiskey barrels on either side of the slider to our Master Bedroom that hold 4 more tomato plants, although those are a “patio tomato” variety I haven’t tried before. 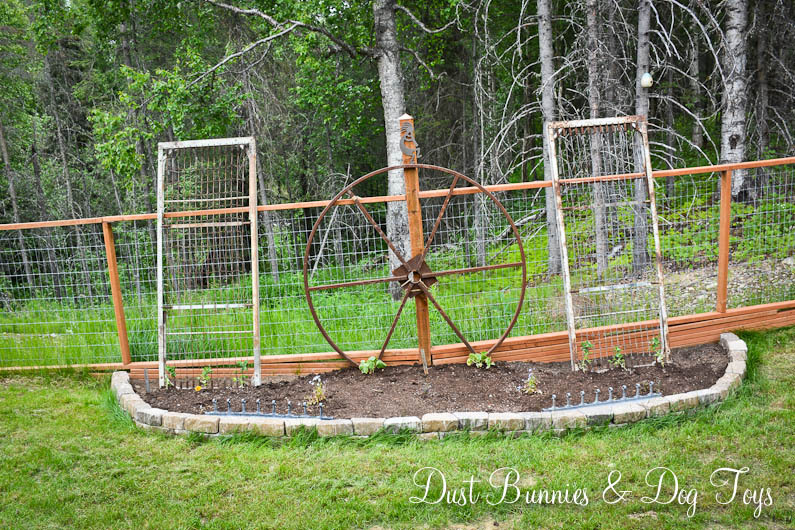 I finally put that amazing rusty metal wheel the Hubs dragged home for me forever ago to use! 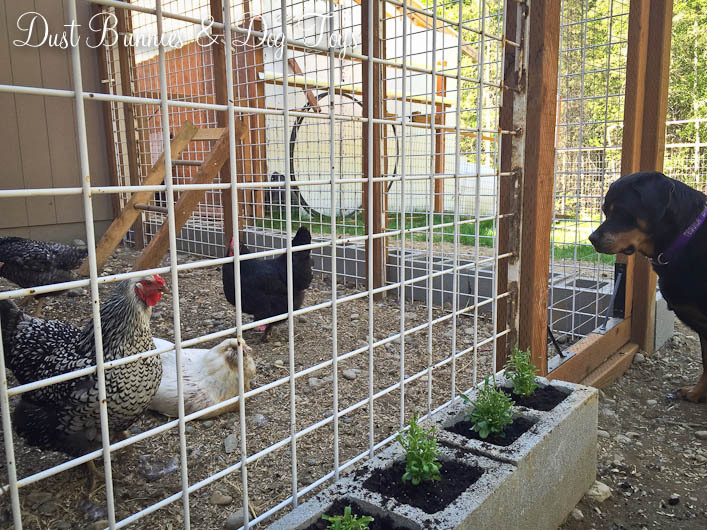 It’s now the centerpiece of our new garden bed where the two metal bed frames I found junking recently also found homes. 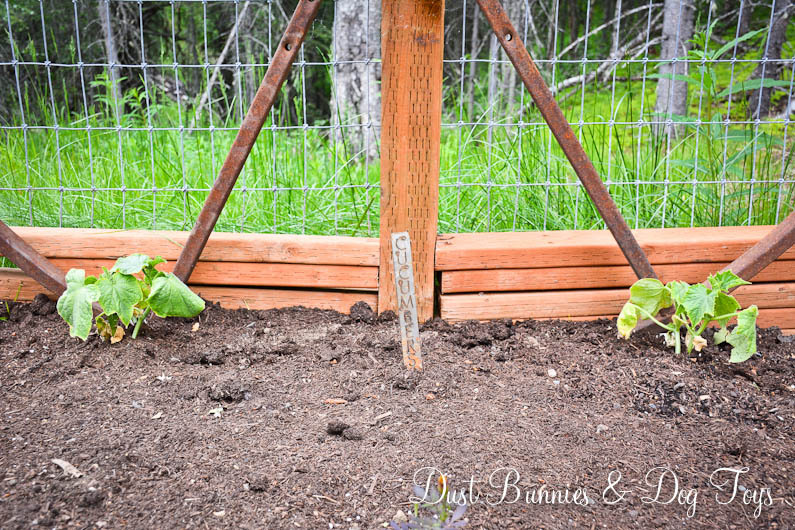 The wheel will serve as a support structure for two cucumber plants and the bedframes will be perfect for the peas to grow up and attach to as they climb. Above all this rusty goodness is a Kokopeli figure, who used to be cloaked in an obnoxious multi-color western pattern. 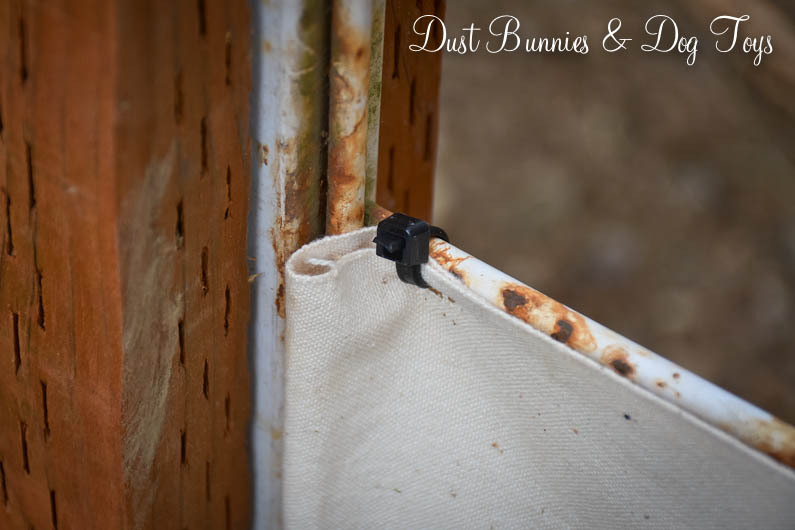 Nothing a coat of spray paint can’t fix! Now he compliments the rest of the metal tones in the bed. And hopefully he works his fertility magic to make these plants grow large and strong to produce a good crop! 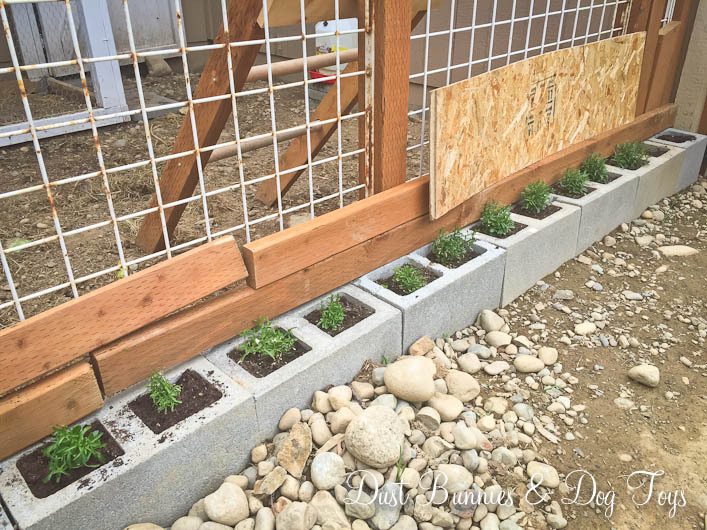 I created the bed using some stone edger blocks and backfilling over the grass with dirt left over from the chicken yard install, topped with garden soil. 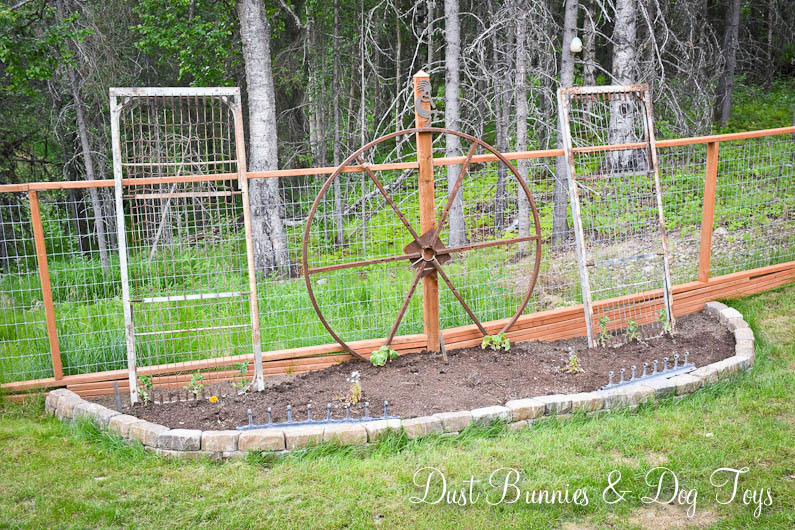 I added a few marigolds and lobelia along the front of the bed and finished it off with two metal pieces sculptures I found when I salvaged the bed frames. Hi everyone! I’m feeling quite a bit better and am back to the usual routine, albeit a bit slower than normal. 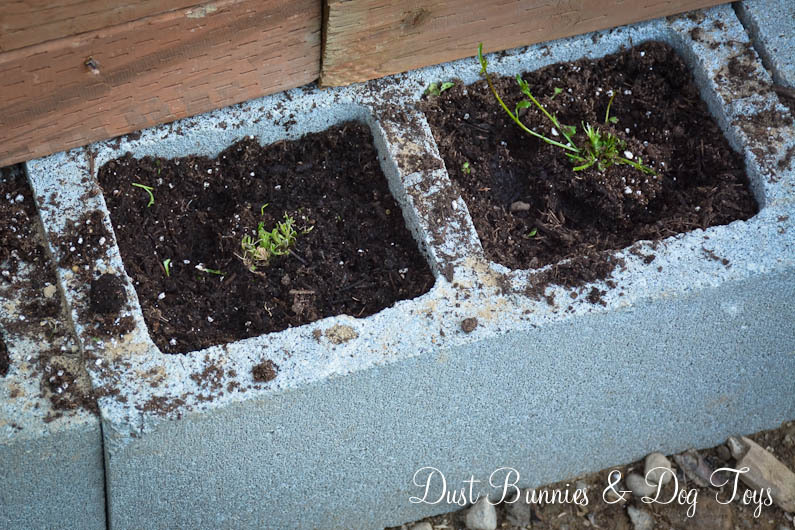 Today I thought I’d share this quick project I did over the weekend to create planters for some extra pepper plants that didn’t fit in our garden box. I originally saw the idea on Pinterest but it didn’t have a tutorial so I just kinda made it up as I went along. These cute pots are actually 5 gallon buckets. This is how they started life. Not quite the look I was going for. 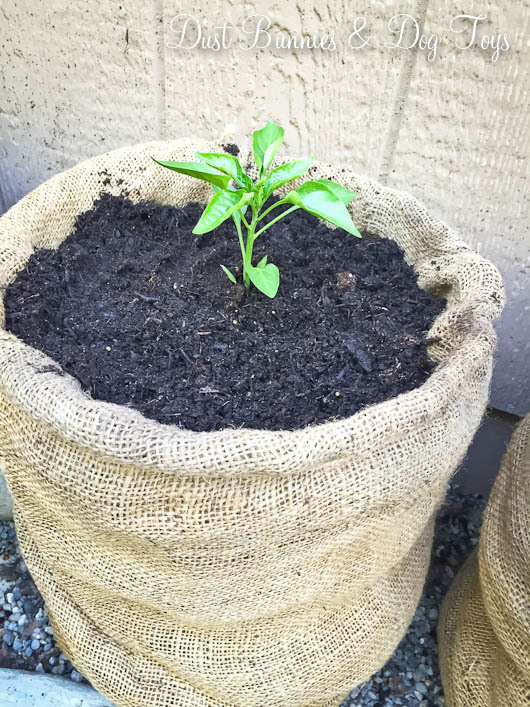 So I dug out some burlap I’d picked up last season and did a test fit to see how it would work. 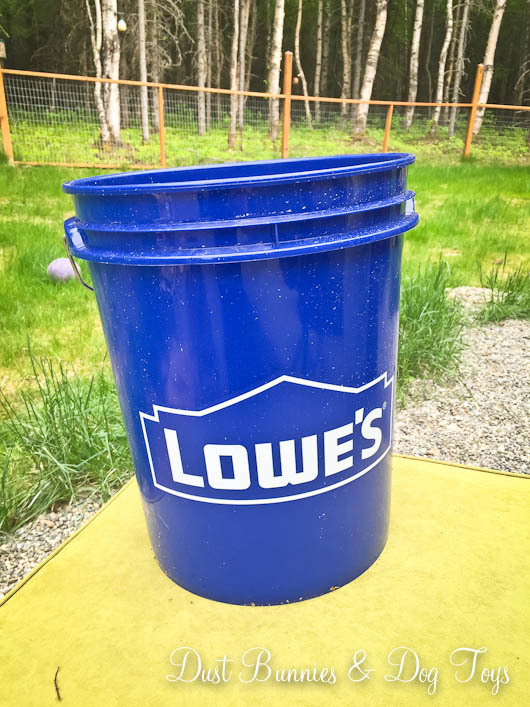 Since my pieces were fairly large I folded them in half, which worked well to block the blue color and store logo on the bucket. 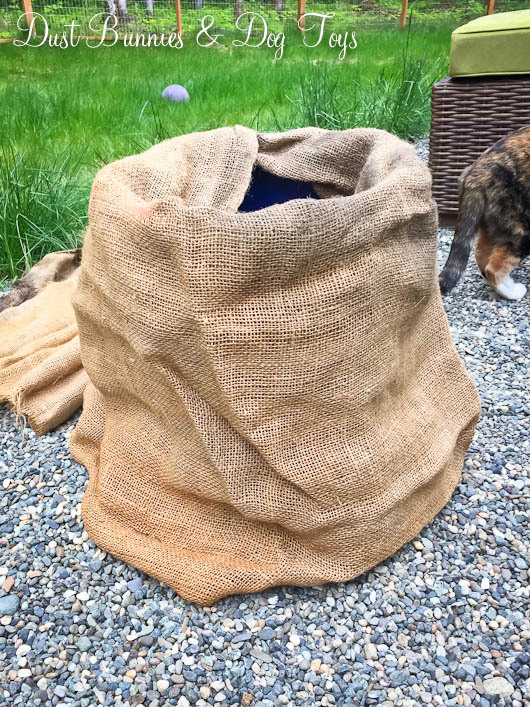 To finalize the fit I laid out the burlap on the ground and wrapped it around the bucket until I was happy with the placement. 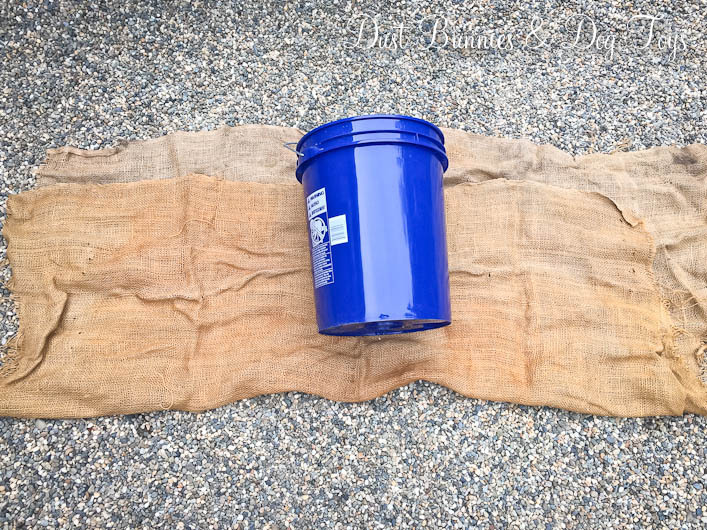 Then I cut pieces of twine and tied it around the bucket at the top and bottom to hold the burlap in place. 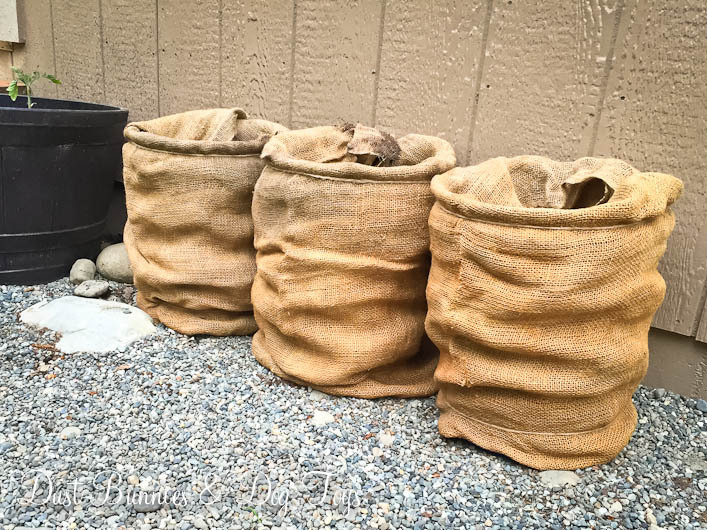 I fiddled with the burlap on the first bucket, trying it both pulled tight and leaving it loose. I ultimately decided I like the loose option which made them look like old grain sacks just filled with dirt. Here they are tied and ready for plants. 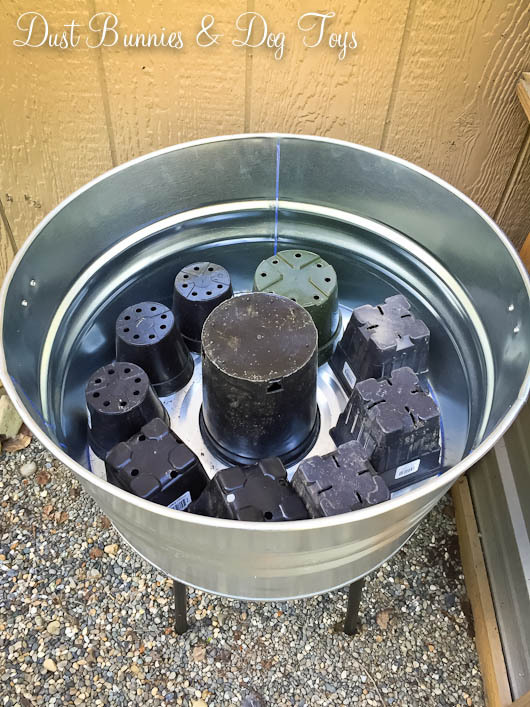 The Hubs drilled a couple of drainage holes in the bottom of each bucket and I filled them with soil. 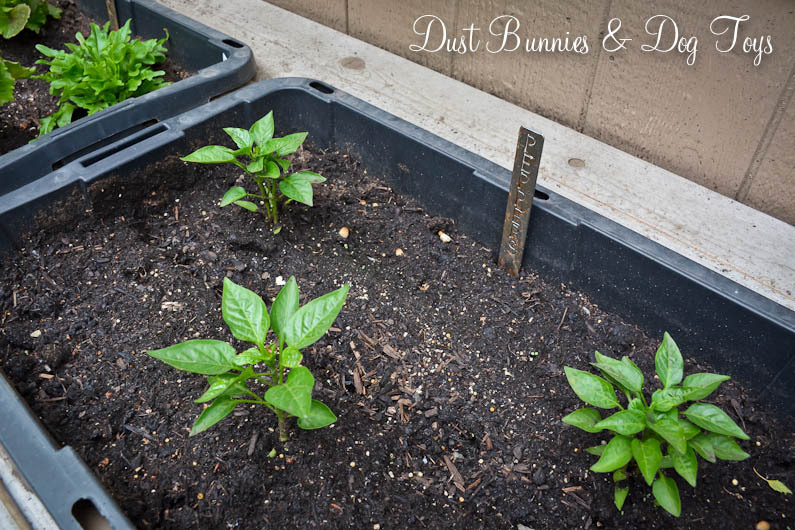 Each got a single pepper plant so that when it grows I can add a support stake or cage. And here’s the finished line up. The Hubs was actually pretty impressed with how nice they turned out – and I know this because he commented on them unprovoked! 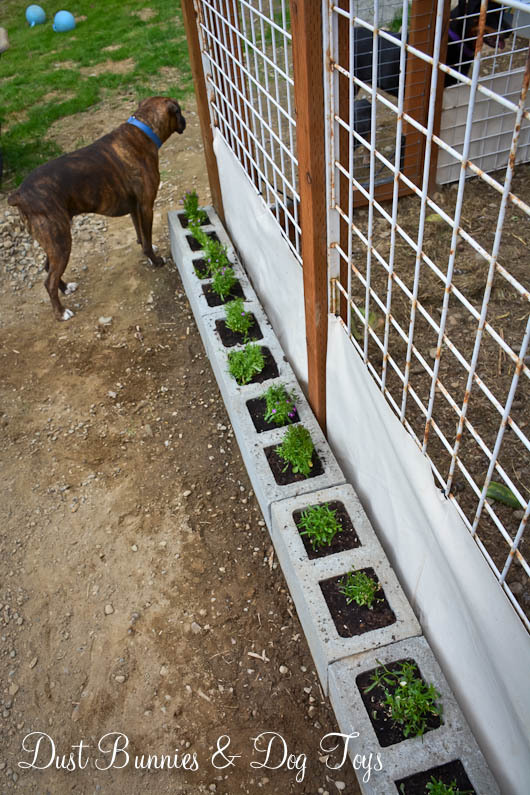 Since I took this shot the other day Brinley decided to ‘help’ with the gardening and pulled the pepper plant on the right out of the soil. Luckily, I caught it quickly and was able to put it back in and give it some extra watering to revive it but I’m not sure it will make a full recovery. Shared on Knick of Time’s Talk of the Town #24.